Kevin Kane, Director, Organizing Co-op Incubator (B.A. Marquette University, M.S.A.E., Marquette University). Kevin joined Citizen Action in 2011 as the Healthcare Organizer and was awarded the "Advocate of the Year" in 2012 by HealthWatch Wisconsin and the 2017 "Community Healthcare Champion of the Year" award by the Wisconsin Federation of Nurses & Health Professionals. 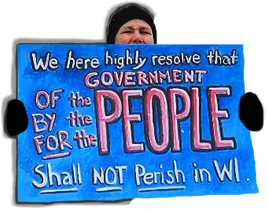 In 2014, Kevin spearheaded the largest concurrent grassroots referendum campaign in Wisconsin history on Medicaid/BadgerCare, with over 1 million Wisconsinites voting, showing super-majority support. He authored reports on health care and economic policy issues. He was a founding board member of the Common Ground Healthcare Cooperative which provides affordable health coverage to over 50,000 members. He grew up in Palatine, IL, and has lived his entire adult life in Milwaukee. *This is an independent event not affiliated with Basics.